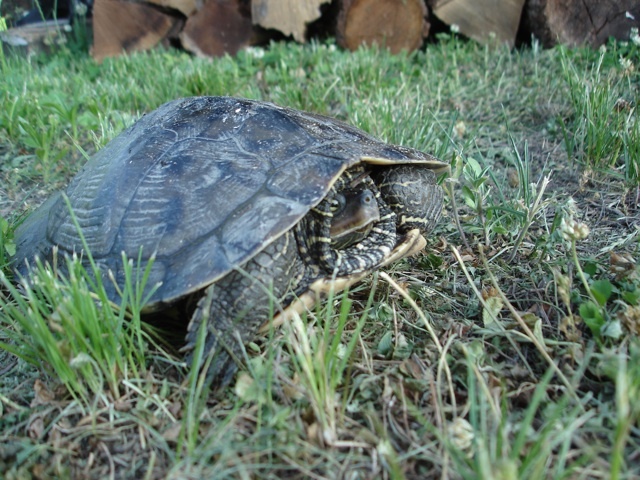 It's that time of year again, when the Snapping turtles come up on the banks and lay their eggs. 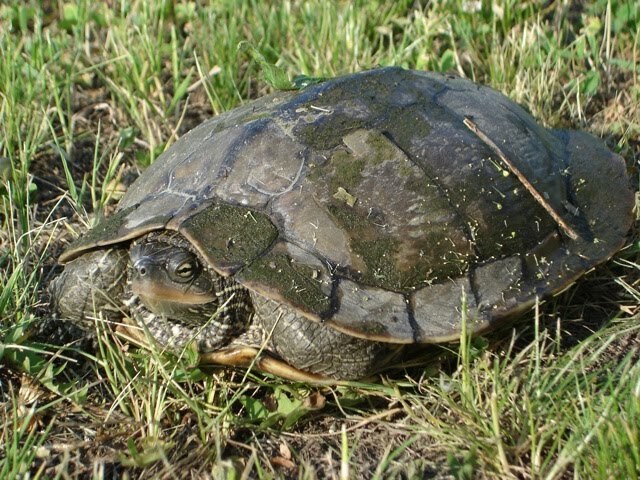 We awoke this morning to two female turtles scuttling across our lot, which would be a good thing except there was no where safe for them to go since there is nothing but roads, rails and construction between them and their egg laying grounds. Slippers investigated them and found them interesting, she is used to the big Box Tortoises in Florida, so these little guys were no big deal to her. She's rather passive about armadillos and such too. 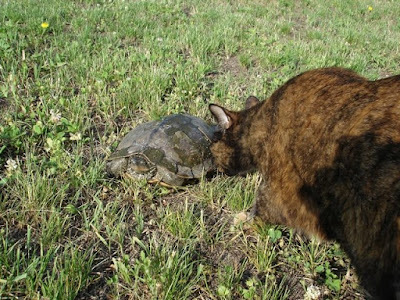 Usually just gives 'em a pat on the shell and moves on, like "Tag your it!" 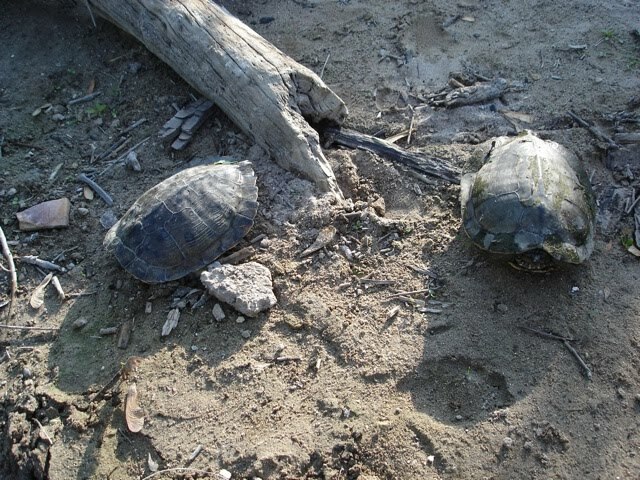 We moved them to an area down the river bank where they might have a better chance of getting their egg laying done safely, looks like it's going to be a busy day picking up turtles, we have spotted and moved several more already this morning and I haven't even finished my coffee! Note June 8: We moved many turtles the last couple days and everyone else in the community did what they could to help them too. It was nice to see a community pull together to help these denizens of the swamp carry on their annual migration. Now to research when the baby turtles will hatch and help them get back to the river in areas where it's dangerous for them! 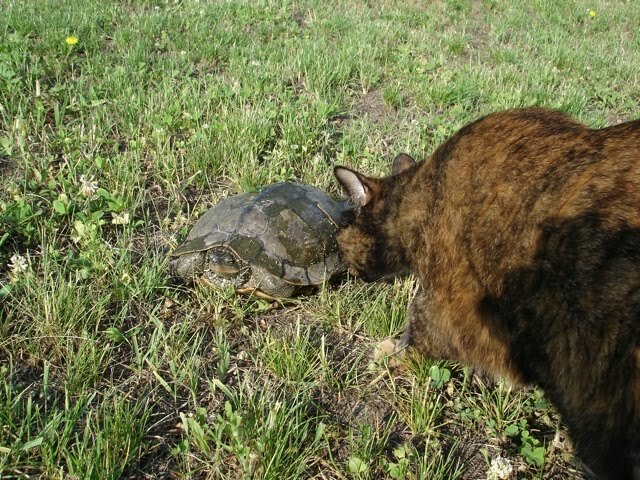 I love the brave cat! That is so interesting, thanks for sharing. Mississippi River RV Lot Finally High and Dry! Rescue Kitty BC Sings Song of Thanks! Cloud Watching and Shish Kabob, Gluten, MSG Free!